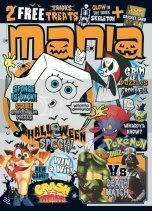 It's Mania time again with issue #79 December 2007, out now, featuring the penultimate episode of Moth & Tanuki. Mania gets a bit previous this time of year, with the November issue off sale before the end of October to make way for this December issue. However, that means that this isn't quite the end for Moth & Tanuki. The next issue, the Summer Special, will feature the last episode. This one stars Tanuki in a weird, non-crime fighting vignette about bizarre worship. That begins to cover another aspect of Tanuki that I've been gradually developing (also in OzTaku). He both is and isn't what he appears to be. Pastel colours this time, after last month's bright primaries. I'm really happy with these last few stories - the M&T world has expanded considerably and the gags are much tighter. Had the series continued I would have brought back one or two earlier characters, and I do think the next four were the best scripts I've ever written. The next (and final) one will star Mothy - it's about her turn! Lately I've been on a bit of a reading and movie-going kick. The reading started before I stopped drawing, but since then I've been devouring a stack of books, particularly nature related writing. Sy Montgomery's The Journey of the Pink Dolphins was a revelation - a real-life, ground (and treetop and water) level exploration of the most ecologically rich region in the world. Montgomery travels the regions of the Amazon, from the polluted to the near pristine, encountering amazing wildlife and fascinating people in every region. Her quest focuses on the remarkable boto, the freshwater dolphin of the Amazon, a friendly, beguiling and unusual creature. As with Brian Payton, Montgomery engages with the local people and recounts their tales - in this case persistent stories of the boto taking human form and abducting people to the Encanta (the City beneath the water). What comes across most strongly is the richness of the wilderness in a place teeming with life of every sort, where the water fairly vibrates with it. This is no dry travelogue, but a traveller's tale rich in incident, observation and daring interaction with nature. Montgomery does ultimately get up close and personal with the botos themselves, but her eye for detail is everywhere. The very next book I read, which came out last year, was The Dolphin People by Torsten Krol (the pseudonym of a Queensland author or authors). Reading this directly after Journey of the Pink Dolphins did it few favours - this world seemed accountably barren of wildlife by comparison (except where needed for plot purposes). The writing was enjoyable enough - a straight ahead post World War II adventure tale about a blended family (with Nazi connections), stranded in the Amazon rainforest and attempting to survive with a local Indian tribe. These four survivors are seen as transformed "dolphin people" by the locals and they attempt to live the myth, with unanticipated results. Given the somewhat adolescent preoccupations of the narrative (the protagonist is a teenage boy), it's not surprising that the female characters fare worst. Overall, okay, but not recommended - reread The Mosquito Coast by Paul Theroux instead :). Journey of the Pink Dolphins is highly recommended though! It's a first-class natural record of a region under threat of destruction, but also a testament to the people who have successfully lived there until now. "Moth & Tanuki" have been cancelled from Mania for next year - bugger! The last episode will be in #80, the Summer special. The latest Mania, #78 November 2007, is out now (cover pic shows the foil bag the issue comes in), featuring the latest episode of Moth & Tanuki. The page shown above is page 2 of Kart Attack, which wasn't an easy episode to draw (but one of the funniest so far, so I had to do it :)). Todd, the kid in the red hat from previous episodes, is sick with chicken-pox, so Tanuki stands in for him in a Kart race. Actually, I reckon I could have got about 10 pages out of this material, but it's a very tight 4 pager. The artwork involved lots of shifts of perspective, "jump cuts," closeups and distance shots, several crowd scenes and the use of layers (for eyes looking through visors and reflections). Once I got the print issue, I did my usual scouring for mistakes - I was worried some of those car numbers would be hanging in space the way I placed them before I lined them up with the art - but the only one I found was something I'm not sure I want to change anyway :). As this story is full on cartoony and over the top, I thought I'd go for something much more character-based with the next episode. Also, I went for bright primary colours this time, so the next one is pastel-shaded to reflect the change of pace. I'm still enjoying this series a lot, and try to let the stories go wherever Moth & Tanuki want to take them. This is a sketch of Martha, my old tenor saxophone, drawn back in about 1984. This was scanned from a bad photocopy, as I'm not sure where the original picture is, and some of the pencil lines show. It was a large picture drawn very quickly in ink on paper, attempting to capture the form without a lot of outline, more by the lights and darks revealed by the fall of the light (in a sense, that's where "the blues" can also be found :)). I love pure black-and-white artwork (as often employed in traditional comics). For any sax players out there, yes, the ligature is on the right way - I prefer not to crush the reed, so always had the screw at the top to keep the reed evenly supported (and you could get a better range of sound that way). I used to play both tenor and alto (which means transposing for both B flat and E flat) - they really are different instruments. I haven't played saxophone in years, but I really should. Nothing can capture "The Blues" quite the way a breathy tenor sax can. I've always liked writing in classical keys, modulating from one to another, but that ain't the blues! I remember when I learnt my first blues scale, then how to mix Mixolydian notes in with it - way blue - that opened up a whole different world! P.S. If you look carefully you can see me with a sketchpad in the reflection.